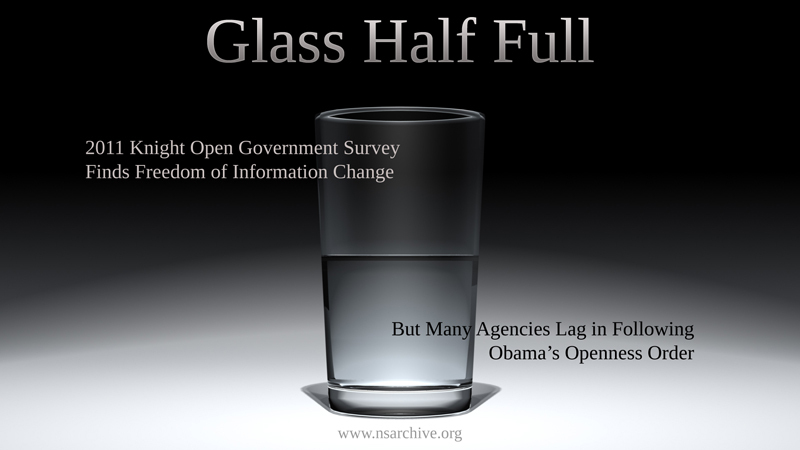 On his first day in office, January 21, 2009, President Obama issued a presidential memorandum instructing federal agencies to “usher in a new era of open government.” In March 2010, however, the 2010 Knight Open Government Survey found that only 13 out of 90 agencies had actually made concrete changes in their FOIA procedures. The resulting national headlines sparked a new White House call to all agencies to show concrete change. The 2011 Knight Open Government Survey team filed FOIA request with all 90 agencies that have chief FOIA officers asking for copies of concrete changes in their FOIA regulations, manuals, training materials, or processing guidance as a result of the “Day One” Obama memorandum, and the March 2010 White House memorandum from then-Chief of Staff Rahm Emanuel and White House Counsel Bob Bauer. The Emanuel-Bauer memo told agencies to 1) update all FOIA material, and 2) assess whether FOIA resources were adequate. Several agencies demonstrated significant changes in their processes, major upgrades to their Web postings on FOIA, and improved responsiveness to requesters. (See, for example, helpful FOIA training PowerPoint slides produced by the Department of Health and Human Services, Department of the Interior, and the National Archives and Records Administration.) But others showed no change as yet, or failed even to respond in a timely fashion to the Knight Survey requests. In one egregious case, the U.S. Postal Service stated it had “no responsive records.” It said it had never received the Emanuel-Bauer memo asking for progress to be shown in response to President Obama’s first-day call for openness. The Archive found significant change among the responsive agencies especially in the area of discretionary releases of information. Before the Obama proclamations, agencies withheld most drafts of internal documents, and even staff-level reports, under the 5th exemption to the FOIA that applies to “pre-decisional” or “deliberative process” information. Openness advocates had long argued that this kind of material was exactly necessary to bring the greatest transparency and accountability to government decision-making. 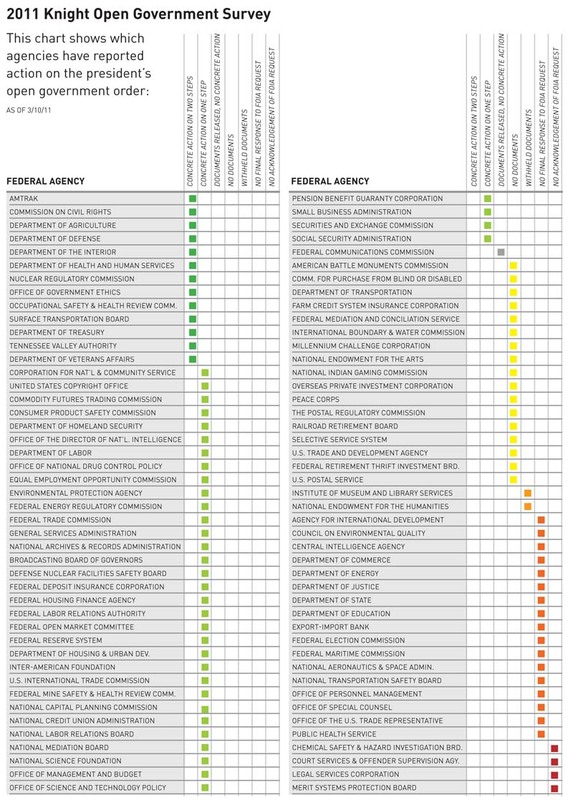 Now, agency reporting shows declining use of the so-called “b-5” exemption, and the 2011 Knight Survey received multiple responses from the high-scoring agencies that included their own drafts and internal e-mails about how to respond to the Emanuel-Bauer memo. A standout here was the Department of the Interior, which provided copies of e-mail exchanges noting how the agency’s own IT restrictions kept FOIA officers from seeing key FOIA blogs – a problem no doubt now remedied. In contrast, 12 federal agencies reported still-pending FOIA requests more than six years old, when the law requires a 20-business-day response time. The Archive’s findings suggest a major part of the problem is the “daisy-chain” of referrals between agencies, since 10 out of the 12 with ancient requests reported similarly ancient referrals.